When I was first transitioning to WFPB eating, I was struggling to find recipes for myself. I was still learning how WFPB eating “worked” and I didn’t know what I would or would not like when I looked at recipes (beyond the basic “Oh, I like broccoli, maybe I might like this?…”). 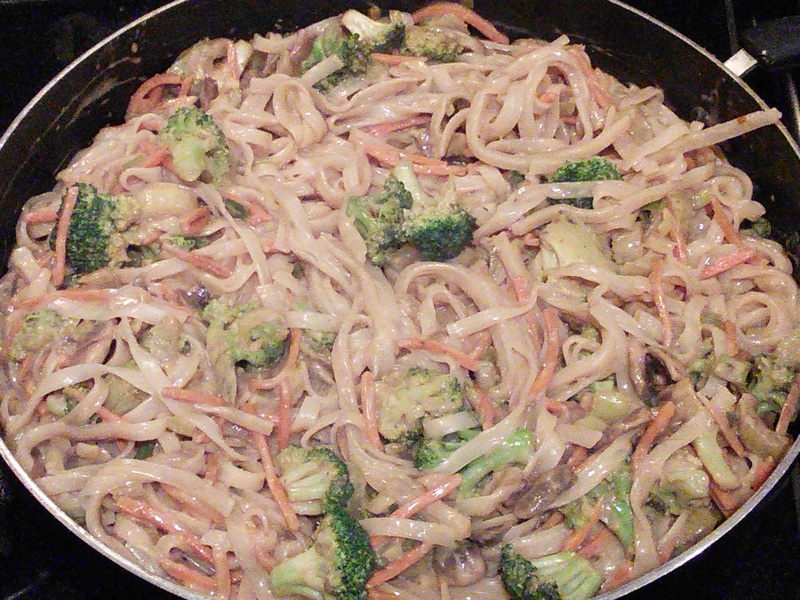 One of the recipes that helped get me through my early months, and has since become a favorite recipe in my house, was the Peanut Noodle Stir Fry I found at mywholefoodlife.com. If there is any one recipe on my blog I could encourage you to try making, it’s this one! It’s simple to make and doesn’t require very many ingredients. The original recipe is a little spicy, but you could leave out the red pepper flakes entirely if spiciness is off-putting for you. The tofu in this recipe is completely optional. I’ve only tried including it once and I wasn’t a fan of the texture it gave—not that I need the extra calories it adds, anyway! The original recipe is extremely noodle-heavy. 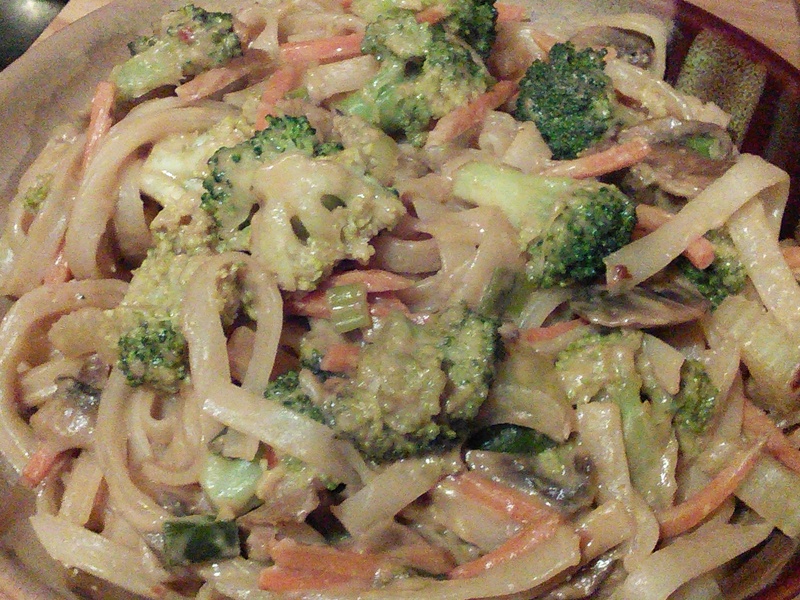 I prefer veggie-heavy dishes, so I usually only use half of the amount of noodles called for. If you want more noodles, include the entire package. Note: In the pictures below I am using an entire package of rice noodles to help give you an idea of how far a full package of rice noodles will go. This is noodle-heavy for my tastes, but you should add however much you prefer! In a large skillet pan (it needs to be BIG!) sauté all of the vegetables for about 7-10 minutes or until they begin to soften. Use water or vegetable broth for sautéing. Keep an eye on the veggies! Don’t let them burn! In a bowl, whisk together the peanut butter, orange juice, soy sauce (or tamari), and red pepper flakes. 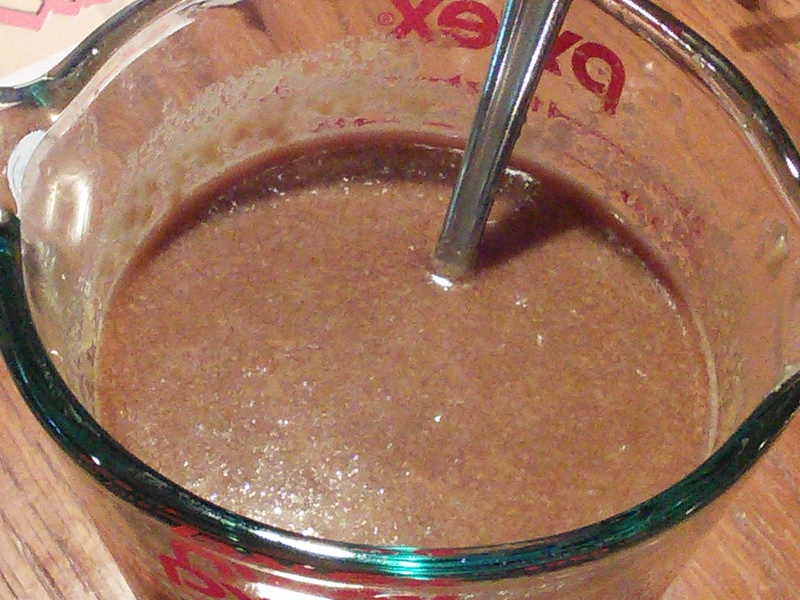 I use a fork to whisk & scrape the edges to make sure the peanut butter is mixed in well. 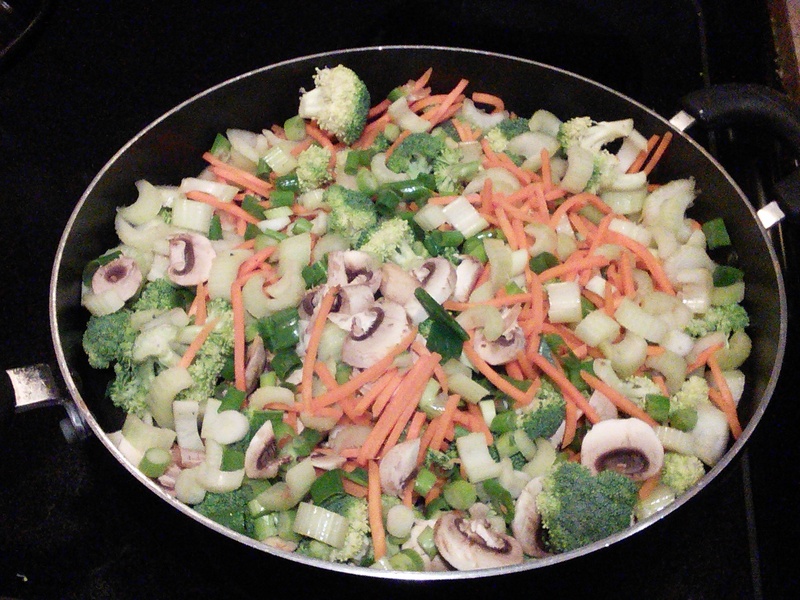 When the veggies are softened, add the sauce to the veggies and mix well. 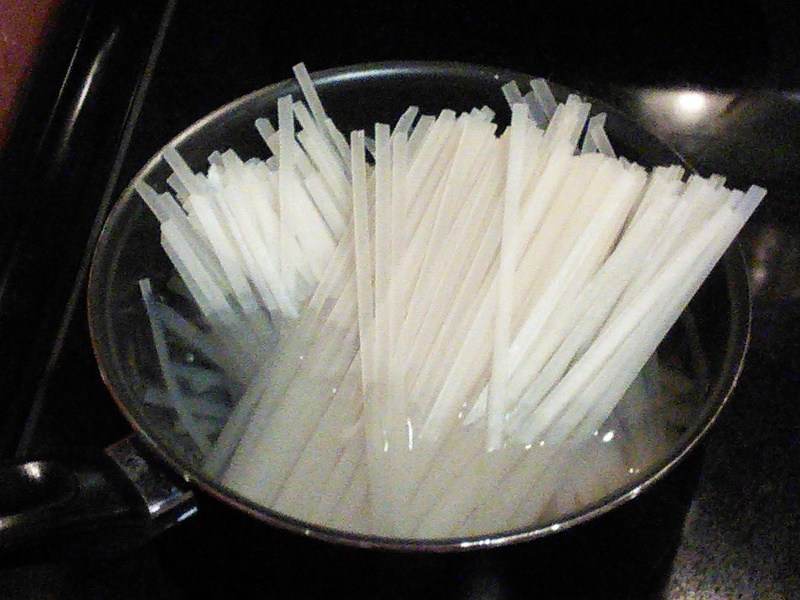 Before adding the noodles, rinse them under cold water and strain. 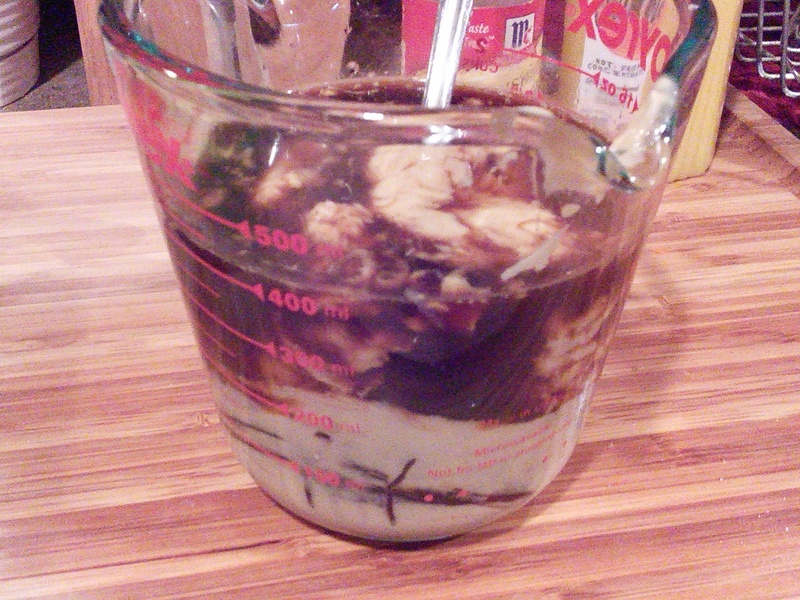 Mix in the noodles very well. Sauté another few minutes until everything is nicely incorporated and heated through. Serve hot! This makes great leftovers, too!